Want to head out and fly your DJI Spark, but have way too much stuff to carrry? Now it's time to invest in the perfect bag or backpack for your new baby! Carry all your Spark gear with ease, protect your drone and be ready with backup batteries and chargers! I was just on a recent trip overseas and having everything in one easy bag ready to go is crucial. Now, let's take a look at the best options you have for the DJI Spark in terms of bags. In this review I have tried to give you a broad range of bags to choose from so you can find one that fits you and your Spark flying needs. If you only have your Spark and phone, then you are better off with a simple and small bag that you can simply sling across your shoulder and go. However, if you have more gear (chargers, batteries, remote etc) or intend to, then look for something you can either fit it all in or grow into with time. Some of the smaller and cheaper bags have a simple and thin strap (often just for one shoulder) because the load will be small (drone only). If you want to carry more or for longer, consider a backpack with nice padding​, venting for your back (sweat!) and maybe even a hip belt if you intend to carry a lot more (water, other camera etc). Although you often pay more for features like handy slots for SD cards or spare propellers, they really come in handy. Not only for organizing your stuff for your flying but also for storage. I used to have all my drone stuff all over the place and not only does it annoy my girlfriend but you lose or misplace things. Do you only need a bag for your drone and controller? Or, would you like to also carry and find your spare props, batteries and charger as well as have space for your phone or tablet. This simple yet handy shoulder bag from Power Extra is perfect for carrying your Spark. It has a nice padded interior including a divider (which you won't need with the Spark). There is also a roomy front pocket under the flap (where you can put your phone, charger, cables etc). There is another on the front flap for a few more things. 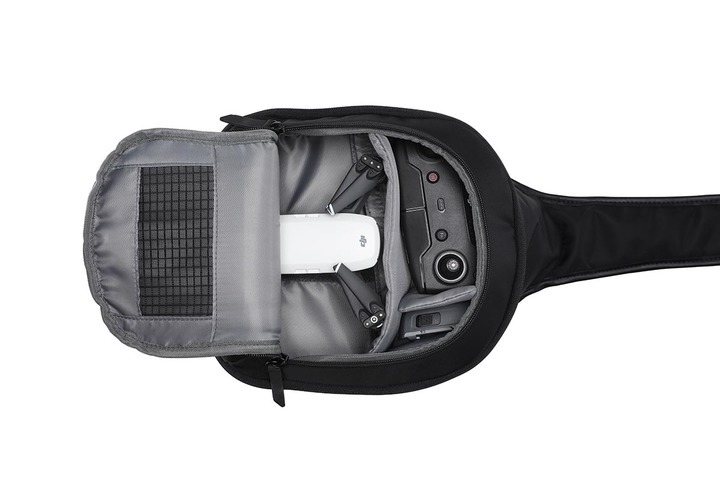 Taking simplicity to the next level is this sling bag from DJI. It is simply an adjustable shoulder strap and a bag with padded interior. There is also a divider as it was designed originally for the Mavic + controller. It can also fit the DJI Goggles as well as the DJI Spark. So, it's super simple, light and small​, and can fit your Spark, controller and spare battery (see image on right/below). Note:​ like all DJI accessories, it is also expensive for what you get. Similar to the sling bag from DJI, this shoulder bag is a simple bag to carry most of your Spark gear. It can fit the Spark, controller and spare batteries. Check out the video below to see how it all goes in. There is also the usual zippered mesh pocket in the flap for cables or SD cards (always handy).​ And another pocket on the front for other gear. It is made of quality materials and is made by DJI themselves. It is about 20-30 bucks cheaper than the sling, so if you are comparing the two options, this one might be the cheapest. I believe it is also in many Fly More combos you can get for the Spark too. Lowepro make some of the best camera bags out there, and lucky for us they also double as great drone bags! The Adventura is a simple and well made shoulder bag to carry your Spark and gear in. It has a nice padded shoulder strap, as well as nylon padded and divided (removable) interior for spacing your gear how you want. There are also lots of handy pockets - side elastic pocket (tripod, water bottle), front slide pocket, top zipper, interior mesh (SD cards, cables). See the video opposite/below for more details. If this is the kind of bag you want, you won't regret it. I use the CS 80 for my Mavic Pro and carry it inside other bags. It is super well made and designed and easy to adjust. Another great Lowepro option is this backpack with separate drone case. The Viewpoint is a great backpack that has a dedicated slide out slot on the side for your drone case. So, when you are moving around (hiking, walking, traveling) you can simply stop and slide out your drone for use. Inside the backpack is also super well organized. There is a back slot for tablet or small laptop (15"), accessed from the top. An good sized inside compartment which is on top of the slot for the drone, which can be used for other gear. There is also a small pocket and headphone loop in there. This area can also be opened up to make a full backpack space when you are not using it for your drone. Making it perfect for other options. The straps and back padding are well designed and meant for carrying loads and avoiding sweating. There is also a side pocket for water and front clips for tripod or other things you might carry (skateboard?). All in all, this is a pro backpack at a reasonable price (often under $100 for the pack alone, and under $40 for the CS 80) for a great day out with your Spark! The Lowepro Tahoe is a more compact and light version of the Viewpoint. That means a little less space of course, but it might just be the perfect option for your Spark and gear. The interior has the divided/padded area for arranging your drone, controller, spare batteries etc. Above that is a zippered open pocket for things like the charger or cables. ​The front pocket is well-designed with a space for a tablet (suspended above the bottom for protection) as well as other gear like cables, pens, phone, keyholder and SD cards. On the side​ are two pockets for things like a water bottle, tripod or umbrella. This kind of bag is more minimal than the larger and more versatile ViewPoint, and lighter (almost one pound lighter). Price wise it is also a lot cheaper (under $70 and does not need the CS case either) at almost half the price when the extra case is considered. The only downsides I can see on this backpack is lack of hipstrap, and also once it is set up internally for your gear it is less easy to change fast for other purposes. Something the Viewpoint can do better with the slide-in case.